As I put my dining room pieces back in place I have been taking a look at the artwork I have in the house and what I had in the dining room before it was repainted. Does it still work? This piece - pastels on canvas - was picked up at a fundraising art auction held at the kids' nursery school many years ago. I loved the marketplace stall as subject. The vibrant colors as well as the texture drew me to the piece immediately although I had found the frame heavy at the time. This is the only picture I have of the artwork in the dining room before - you can catch a glimpse of some of the previous green paint color to the right. This is when it was taken down from the wall. There is a dusting of antiqued gold paint over the predominantly black frame. And now, I am trying it on the new walls. The frame blends in and the colors pop! 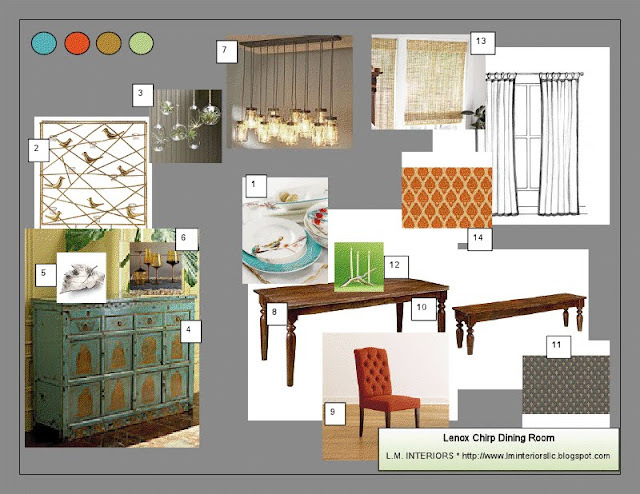 Remember the inspiration picture I came across after I had started work on the dining room? This was part of the post on the Goldeneye Resort in Jamaica. And coincidentally, again, back in November I had participated in a mood board party over at Pewter + Sage and the inspiration had been dinnerware with which one had to create a dining room board. Here is the board I had created. For further details about the items go here. I seem to be subconsciously drawn to the combination of these colors in a space - burnt orange, gold, shades of aqua, smoky grey. Modern. Global. Vibrant. Calming. All at the same time. And back to the current artwork. It has some of the blues - a touch of cobalt and some aqua in the background - and shades of orange and gold and some dark grey, and of course, there is the touch of gold on the frame which is apparent on the right-hand side as light shines on it from the living room. This picture appeals to me in this spot. The eye is drawn to the artwork without taking away from the stencil. And the frame does not bother me.